We at Raise Ur Paw and individuals of humanity worldwide are extending our reach to you in hopes of gaining your attention and urging your immediate action to not only abandon the efforts to continue the commercial seal hunt, but to bring to an end this perishing industry in which has put blemish upon Canada. This urgency for action and attention has been requested for numerous years -- stemming from individuals, organizations and even celebrities who have worked determined and dedicated through protests, presentations, images and evidence in order to gain the support of the Government and its Prime Ministers to do what is needed to be done in order to save and protect the innocent lives of our voiceless from such inhumanity, cruelty and threat. Yet even with the extreme amount of awareness, markets globally for such products and distributions of seal diminishing, plus collapses, bans/prohibits of imports/exports from major trading partners (US & Eur) the Canadian Government and the Federal Fisheries Department are still blinded by their own reasons that this industry is humane and sustainable and even quotas of seals is being increased for products such as fur, seal oil (health supplement) and aphrodisiacs (things that I am sure we can live without)-- and that through this blindness, tens of millions of dollars from taxpayers has been distributed as subsidies to fund this dying industry. How can we as a civilized society excuse such actions that are being displayed by the commercial seal hunt and the role of the Canadian Government, to ignore the fact that this industry is causing an extreme threat along with climate change against the populations of seals, that it is giving the sense of unrealistic hope to those participating and made investments in the commercial seal hunt that things will get better, even though evidence is clearly showing that such ways of thinking is just a hope that is dying along with this industry. Through the outpouring of outrage and protest --- perhaps we can come to a beneficial solution, a strategy in which may just very well be a positive dealing for this issue and that is a Federal Sealing Industry Buyout: According to a poll that was conducted by Ipsos Reid, between Dec. 7, 2009 - Jan 24th, 2010 (according to report) it revealed that half of Newfoundland Sealers (holding an opinion) supported a Federal Buyout of the Sealing Industry. 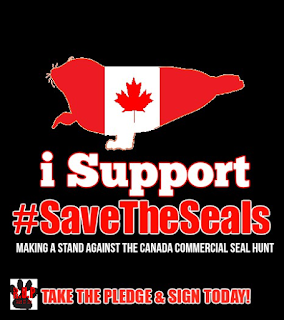 This buyout would not only compensate sealers and vessel owners (according to report) but it would also relieve the burden from taxpayers whose monies are going towards subsidies of such commercial seal hunt, and therefore such funding could be distributed to other issues that are in desperate need of attention and funding, and thus allowing the Canadian Government to bow away from the ties and participation it has with the commercial seal hunt. We believe that we can come together as a unity and create positive impacts and differences -- and that with leadership and influential support we can truly show the greatness of our nation and world for not just humanity, but for all life. This is Canada's opportunity to lead, to educate, end the seal hunt. I support a Federal Sealing Industry Buyout.